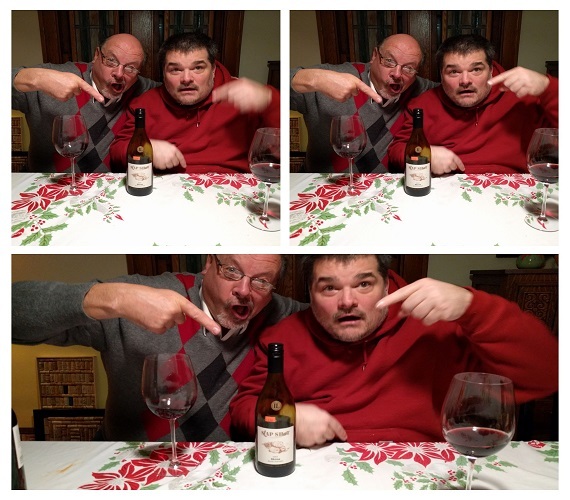 Copain 2013 Wendling Pinot Noir, Anderson Valley (California) ... Dave's a pinot-phile and he shows his great taste in them with this opener: the first thing you notice is the long finish (funny but true) then everything else starts to come into focus, the earthy, toasty plum-cranberry, burnt-raspberry, smoky-pomegranate, white pepper; it's lots of fun for the tongue. 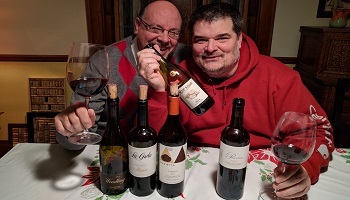 Allegrini 2014 La Grola (Italy) ... This had all the markings of something we might enjoy, but the pine resin / needle and forest floor nose should have been a tip off to our mouths; palate was more herbal and spice, with plenty of perceptible alcohol plus pine with dark fruit nibbling around the edges. Marietta 2014 Christo (California) ... 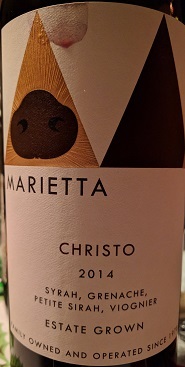 I'm a fan of Marietta's non-vintage lot series, but Dave pulls out this 60% Syrah, 22% Petite Sirah, 14% Grenache and 4% Viognier blend and I'm gobsmacked: mocha, black cherry, spicy black pepper, big, bold, and brash, but layered with subtle floral from the Viognier, plus some cigar box and dark plum; the 15.2% alcohol also came as a surprise. 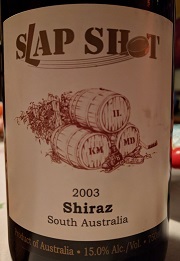 Kilikanoon 2003 Slap Shot Shiraz (Australia) ... I brought this sucker along, Dave sold it to me some 10 or so years back, it was being cleared at $5.99 and nobody wanted it till Dave got his hands on it, then he couldn't keep it in stock. At 14 years of age, a celebrity branded wine, and with chees-o packaging this wine has no right to be this good and for $5.99. You could have knocked us both over with a feather: raspberry, chalky mineral, cherry, plum fruit and all so still alive and lively - soft, supple, smooth, and totally delicious - as it may open we kept coming back to it thinking it would soon die, but instead it got better and our last sips were of pure red fruit freshness, bright and lively with a subtle hint of white pepper. 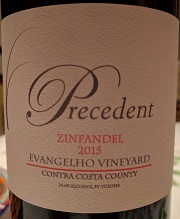 Precedent 2015 Zinfandel, Evangelho Vineyard - Contra Costa County (California) ... Dave knows my penchant for Zin and he delivers a delight every year; this one hit all the Zinfandel highlights: cherry-cola, Dr. Pepper, and some pretty floral notes on the nose, plate proved to be rich in cherry, plum, and blueberry ... the fruit was soft and elegant and the wine was just superbly good - I expect nothing less from a Dave-Zin-pick. 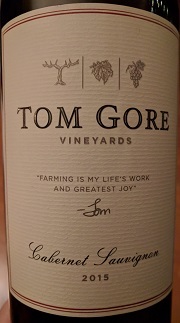 (December 22, 2017) ... Until a few weeks prior to tasting this wine I had never heard of Tom Gore (Frank Gore yes) ... My thoughts were, where has this wine been all my life? 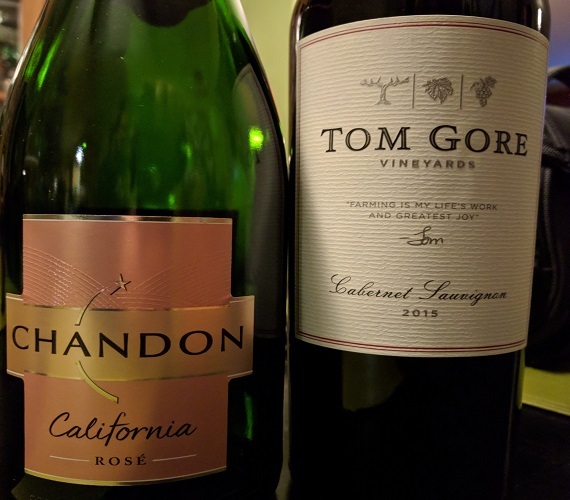 A juicy California number for under $20, and I hear you saying "they are a dime a dozen", but I'm not talking the sweet versions, this one is juicy yet has a serious side. The fruit reigns supreme here with aromas of black raspberry and subtle mocha ... This follows onto the palate adding hints of vanilla and a long black fruit finish.